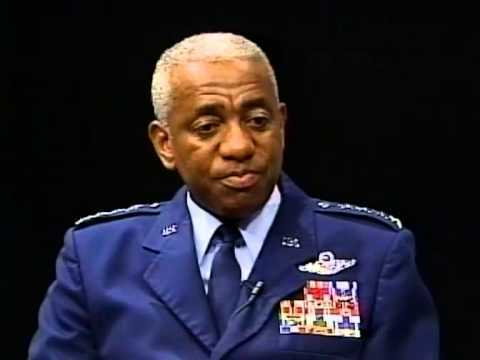 Four-star general and precision flier Lloyd W. Newton was born December 24, 1942 in Ridgeland, South Carolina, the fourth of seven children of John H. Newton, a farmer, and Annie Newton. Finishing Jasper High School in Ridgeland, he majored in mechanical engineering at Tennessee State University. He completed the Reserve Officers’ Training Corps (ROTC) program there and graduated with a degree in aviation education and an officer’s commission in the United States Air Force. Fifty-three weeks of pilot training at Williams Air Force Base in Arizona was followed in 1967 by one year of combat duty in South Vietnam flying 269 missions in the F-4D Phantom II long range fighter-bomber out of Dang Nang Air Base. His tour included 79 missions over North Vietnam. Promoted to captain in 1969, Newton made his first of three applications to join the Thunderbirds, the flight demonstration squadron of the U.S. Air Force. In 1974, on his third try, he became the first African American to be accepted by the elite team and over the next four years served as show narrator informing audiences about maneuvers, occupied the positions of slot pilot flying fourth position in the diamond formation, and also was right wingman in the second position in the formation. Promoted to major in 1980, Newton served as Air Force liaison officer to the U.S. House of Representatives. By 1986 he had been promoted to colonel and been in command positions at Hill Air Force Base in Utah; had returned to Washington, D.C. to attend classes at Industrial College of the Armed Forces; and had earned the master’s degree in public administration at George Washington University. After completing administrative assignments in the Directorate of Plans at Air Force Headquarters, he left Washington to command the 71st Air Base Group and the 71st Flying Training Wing at Vance Air Force Base in Oklahoma. In 1990 he took command of the 12th Flying Training Wing at Randolph Air Force Base in Texas and in 1991 commanded the 833rd Air Division and the 49th Fighter Wing at Hollman Air Force Base in New Mexico. By 1993 Newton was director of operations, J-3, U.S. Special Operations Command at the MacDill Air Force Base in Florida. These successful assignments resulted in promotions to brigadier general in 1991, lieutenant general in 1993, and major general in 1995. In March 1997, Newton was given command of Air Education and Training Command at Randolph AFB, comprised of 13 bases, 43,000 military personnel, and 14,000 civilian workers. A month later he was promoted to 4-star general. As an Air Force pilot Newton logged more than 4,000 flight hours in several aircraft, including the F-15 Eagle fighter jet and the F-117 stealth fighter. Among his military awards are the Distinguished Flying Cross, Legion of Merit with oak leaf cluster, and the Republic of Vietnam Campaign Medal. When he retired from military service in 2000 he was hired as vice president for international military programs and development at the Pratt & Whitney Corporation. Newton and his wife, the former Eloise M. Morning, have five children. Catherine Reef, African Americans in the Military (New York: InfoBase Publishing, 2014); “Lloyd W. Newton” at https://www.bloomberg.com/research/stocks/private/person.asp?personId=545497&privcapId=308916; “Lloyd W. Newton” at http://people.equilar.com/bio/lloyd-newton-torchmark-corporation/salary/110082.